Clean, rinse and dry peppers. Cut the tops off the peppers, carefully clean out the seeds. 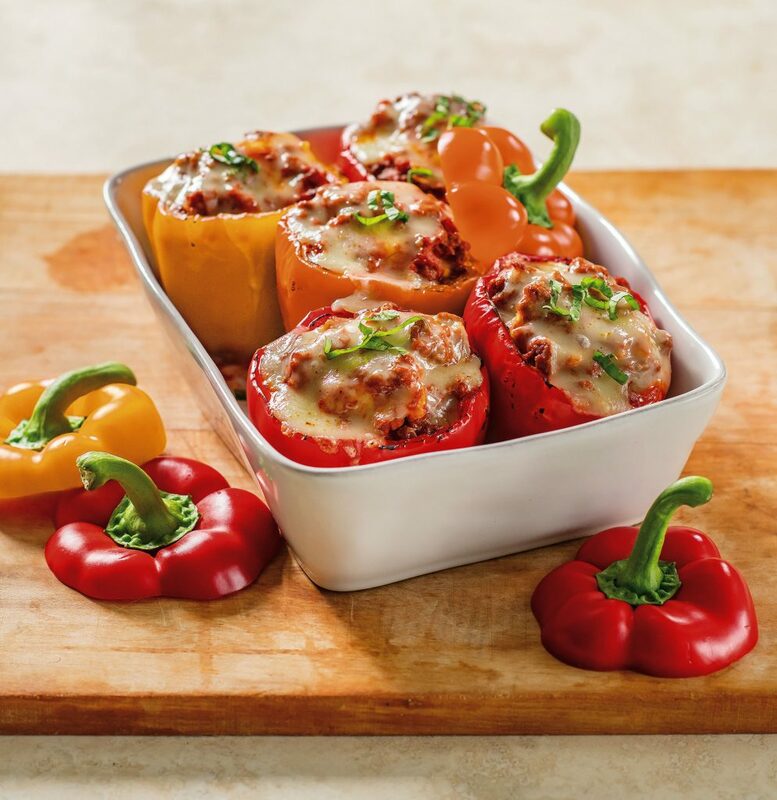 Place all 4 peppers in a small baking dish, standing up, side by side. Place in oven at 350 degrees F for 25 minutes. Meanwhile, brown the ground beef, drain the excess grease and set aside. Using the same pan, sauté chopped onion and minced garlic in olive oil. Add the jar of marinara and salt and pepper, to taste. Stir and let simmer. Add chopped meat. Stir in chopped basil. Leave on low heat, to keep warm. Use a slotted spoon to remove each ravioli from water and gently place on a lined baking sheet or a flat surface. This is to keep ravioli from sticking together. Remove peppers from oven. Let sit for a couple of minutes, to cool slightly. Remove one pepper at a time from pan. Spoon in about 1 Tbsp. of chopped meat sauce. Followed by 1 ravioli. Repeat until you are at the top of the pepper, finishing with sauce. Cover pepper with 1 slice of cheese. Place pepper back into the baking pan and assemble the next pepper and so on. Once all 4 are stuffed, return to oven and bake an additional 20-25 minutes, or until cheese is melted and brown.